The first in Milwaukee Chamber Theatre's multi year installments of the popular Jeeves series. The sound design consisted primarily of period music for transitions along with the requisite period telephone and comical door knocks. I did construct an elaborate crash box complete with rattling latches and breaking plates that was used to great effect. Lots of period music was needed for this faithful version of the Noel Coward classic. 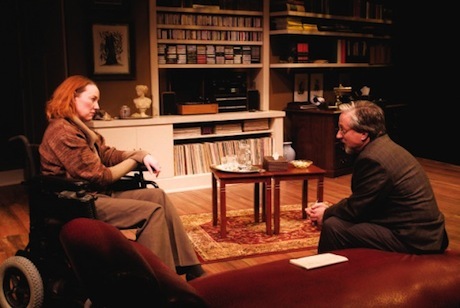 An intimate play staged in the Broadway Theatre Center's Studio space, Duet for One's sound consisted of Bach violin sonatas and Beethoven concertos supporting staging transitions. Each piece was carefully selected for tone and mood, emphasizing reflection upon the scene prior. The very eerie soundtrack to this production was created in part by digitally saturating recordings of traditional celtic folk instruments, violins and voices liberally with reverb and delays. It also featured one of the more realistic offstage fires I've attempted.